“Participant education doesn’t help advisors grow their businesses.” It was an unsolicited objection from the audience of financial advisors. Not being an advisor, I winced and tried to figure out how I, an armchair quarterback, was going to respond. Telling a group of advisors they have to do more participant readiness meetings with their plans is an invitation for objections. Just as most participants do not look forward to meeting with their advisors, many advisors shudder at the thought of providing more participant education. 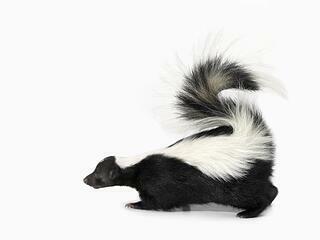 “Can I kick a skunk instead?” I once heard an advisor jest. But why has it come to this? Would it be different for the advisor if participants wanted to be in the meetings? How would the meetings be if participants perceived the advisors as being helpful? What if participants were engaged in the content and openly talked about their assets outside of the retirement plan? I think this would have a profound impact on participant education and advisors’ job satisfaction—and I have plenty of evidence to support such optimism. Engagement means that individuals are eager participants in a process—possibly even leading the discussion. For participants to be truly engaged, they cannot be distracted, disinterested, or passive. In any setting, engagement requires three elements: connecting, internalizing, and initiating. Depending on the situation, these three elements can occur almost instantaneously, indistinguishable to the observer, or they may take time to develop. Let’s briefly discuss each element and then consider examples of how our software, The Retirement Analysis Kit (or “TRAK”, the software Trust Builders, Inc. creates, simplifies the engagement process. Without connecting, an advisor will never be able to start the engagement process. Participants must know that the information is relevant to them and that it is connected to their situation. If this does not happen early in the presentation, participants disengage. The connection point must grab the participants’ attention, freeing them from the distractions of smartphones, long to-do lists, and the rest of their busy lives. The meeting must serve as a catalyst for participants to think beyond the connection point and internalize the information. This happens when participants appreciate what has been shared and think about how it impacts their situation. The process is no longer defined by the advisor. Rather, the participants want to move forward in a direction that they will define. At this point, they are internally engaged. After internalizing the information, participants want to know more. In our culture, people are reluctant to share financial information, so their desire must overcome their inhibitions. Advisors must foster a relationship in which even silly questions are treated with respect. (Caution: The phrase “That’s a good question” implies that there are bad questions and may discourage additional questions.) If the presentation is made in a group setting, arrange separate one-on-one meetings to allow participants to more comfortably share specific information about their financial situation. 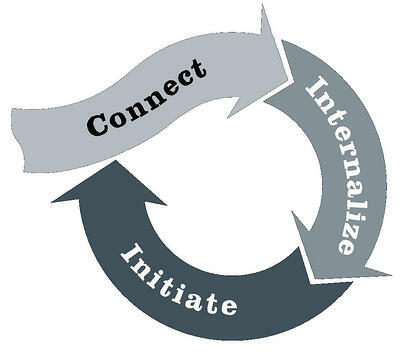 All three steps (connecting, internalizing, and initiating) are essential to the engagement process. And each is easy to achieve with TRAK’s engagement tools. 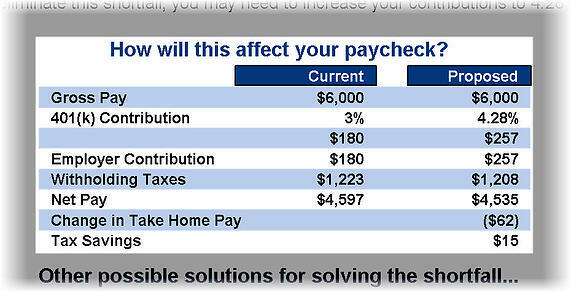 One of the most popular engagement tools in TRAK is the Batch Paycheck report. Drawing on census data, the report provides each individual in a retirement plan with a one-page report that graphically shows how long the projected retirement income will last. 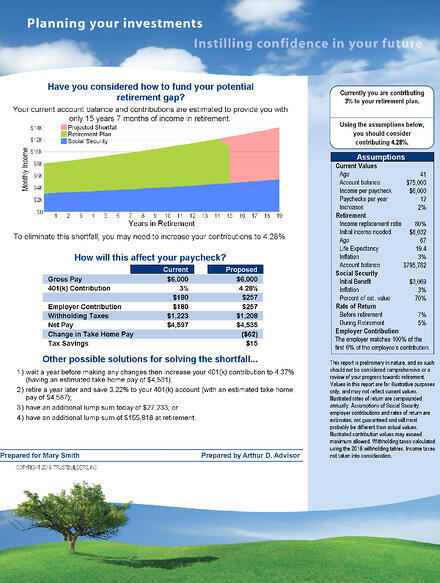 The key to engagement is immediately below the typical retirement income chart, where TRAK’s report shows two paychecks: the client’s current paycheck (which connects the client to the situation) and a proposed paycheck that illustrates an increase in contribution and its effect on current take-home pay. The participant internalizes this second paycheck with thoughts such as, “I’m not sure I can afford that much, but I think I will live longer…. Hmmm, I have other assets that the advisor doesn’t know about. I wonder how they would impact this situation?” Soon the participant is initiating further dialogue and asking the advisor about the impact of additional assets. Once participants are connecting, internalizing, and initiating, the advisor can arrange one-on-one meetings and answer questions quickly with the data already in TRAK. With TRAK, it’s easy to include outside assets, change the life expectancy, and show an increase in deferral. Hundreds of 401(k) advisors have successfully engaged participants by using TRAK. When engaged participants begin offering information about their outside assets, it often results in a significant increase in deferrals. So what did I, the armchair quarterback, say when the audience member objected? I didn’t have to say anything. Another advisor adamantly disagreed with him, saying he owes his greatest successes to engagement in participant readiness meetings, which he used TRAK to achieve. I heard it that day, and I’ve heard it over and over again: engagement in participant readiness meetings dramatically increases advisors’ success. For more information about what TRAK’s engagement tools can do for you try a free trial of TRAK today, or call 503-831-1111 and schedule a webinar to get a personalized tour of TRAK.